Asphalt pavements such as roads, parking lots, taxiways, runways and driveways edure an enormous amount of stress and strain. Vehicle tires continually push and pull at paved surfaces, and weather is a factor with temperature changes and inclement conditions. Traffic and weather work together to create small surface cracks. As these cracks grow and are left untreated, water seeps through to the base and weakens the roadway structure. More cracks form and become wider, eventually forming potholes if not repaired. Roads that are not crack sealed deteriorate much faster than treated roads. 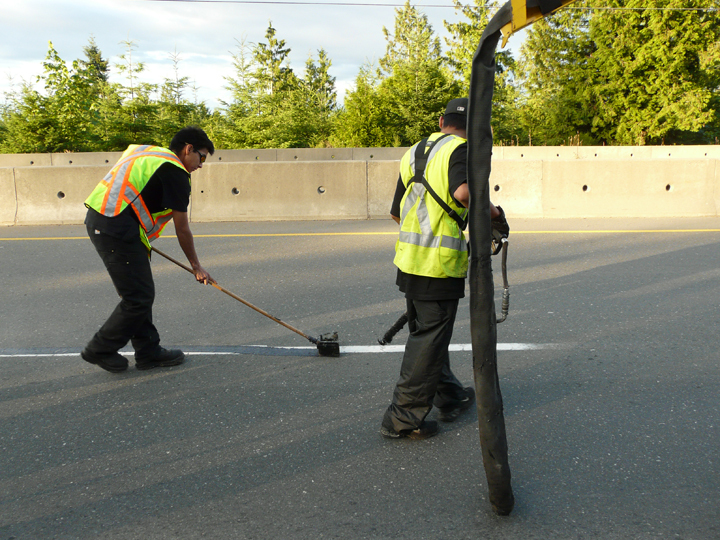 Crack sealing is an inexpensive routine maintenance treatment tht will significantly delay pavement deterioration. Flexible, rubberized asphalt sealants bond to crack walls and move with the pavement, preventing water from evtering. With crack sealing, the lifespan of the pavement is extended and the maintenance costs are greatly reduced over time. Sealtec Pavement Maintenance uses CRAFCO equipment and sealants. Sealtec recommends routing and sealing cracks that are to be sealed with s hot applied, polymer modified crack sealant. Different types of sealant and application methods are used in different situations, as the traffic patterns and usage vary from roadways to parking lots and taxiways to aprons and runways. Let a Sealtec professional help make your decisions easy. Please call us to answer any questions you may have about this or any of the services we offer.